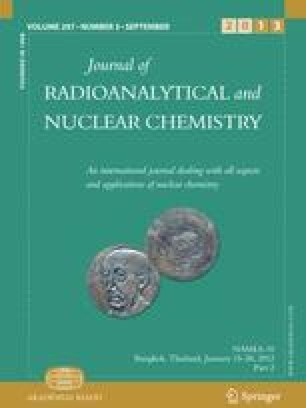 To determine the cross sections of the135Cs(n,γ)136Cs reaction, a sample of135Cs included in a “standardized solution” of137Cs was used as a target and irradiated in a reactor. The ratio of the atom number of135Cs to that of137Cs was determined to be 0.89±0.03 with a quadrupole mass spectrometer. The thermal cross section and the resonance integral measured in this study were determined to be 8.3±0.3 and 38.1±2.6 b respectively.